Team So. 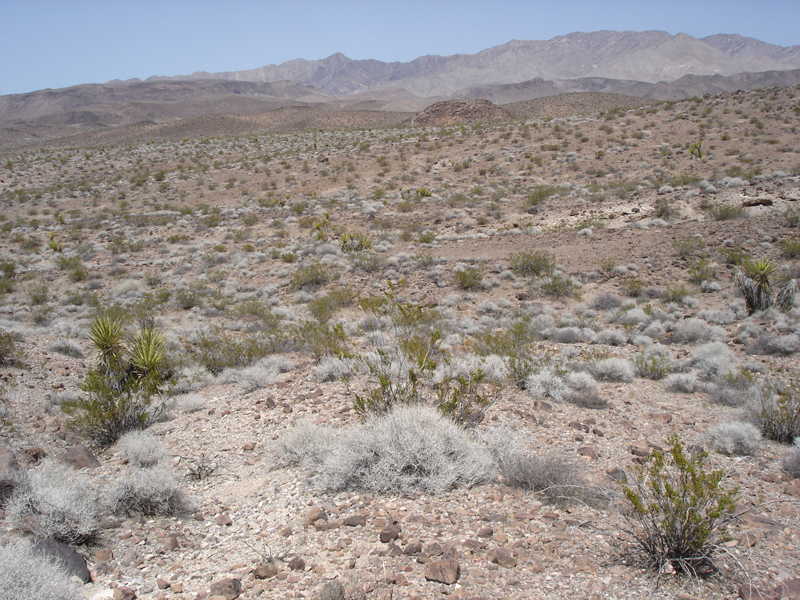 Cal., this trip consisting of Roy, Cody, Tom, Bob, Robby, and myself, got out this past Sunday and drove deep into the Bristol Mountains to search the desert pavement for meteorites. 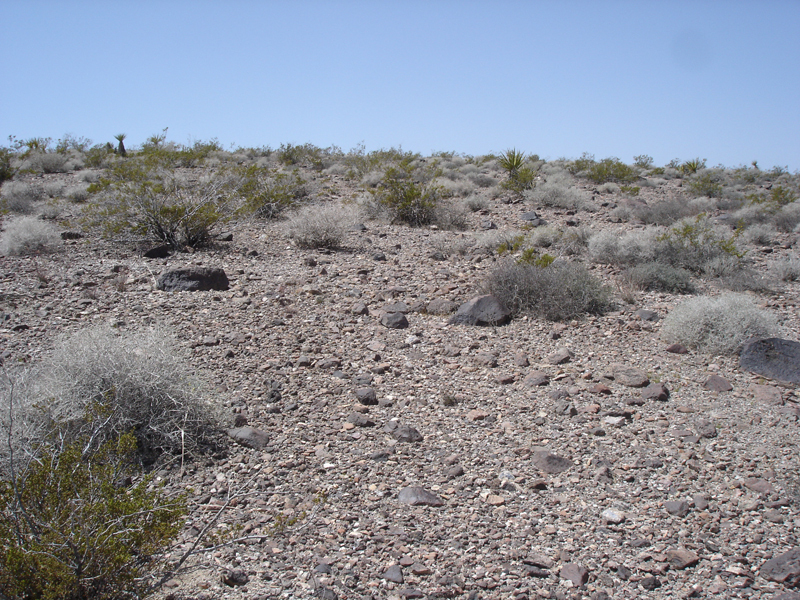 The terrain and geology of this area appears to be perfect for finding meteorites. 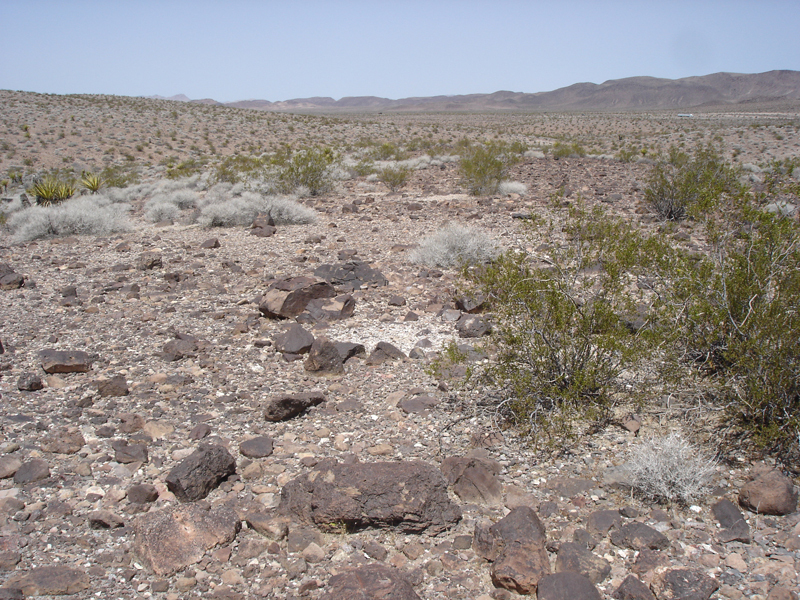 The surfaces out there are old and undisturbed, with most of the rocks covered by a nice desert patina which can only happen when they do not move for a very long time. Everyone commented on how similar it looks to Franconia, except we have Yucca here one hundred miles west instead of Ocitillo. 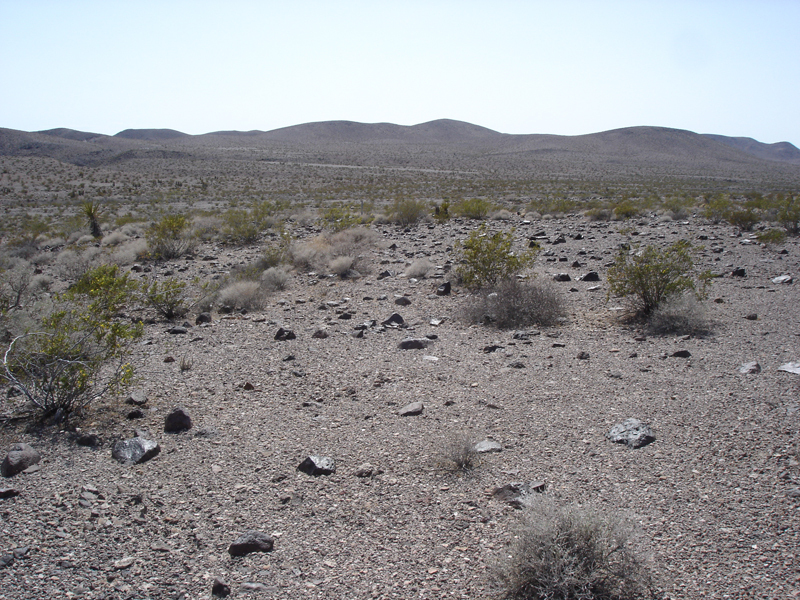 But the Mojave is the Mojave, and there's bound to be meteorites out there! [below] After several miles of following a BLM 4x4 trail (and taking a wrong wash a couple hundred yards before doubling back on a few occasions) we arrived at the gps coordinates I had picked as our staging area. We parked the trucks (Bob and Robby's Toyota is just out of frame), geared up, grabbed the detectors, and started the hunt. I switched from my 14" coil to my 10" for this terrain (it's a bit lighter). 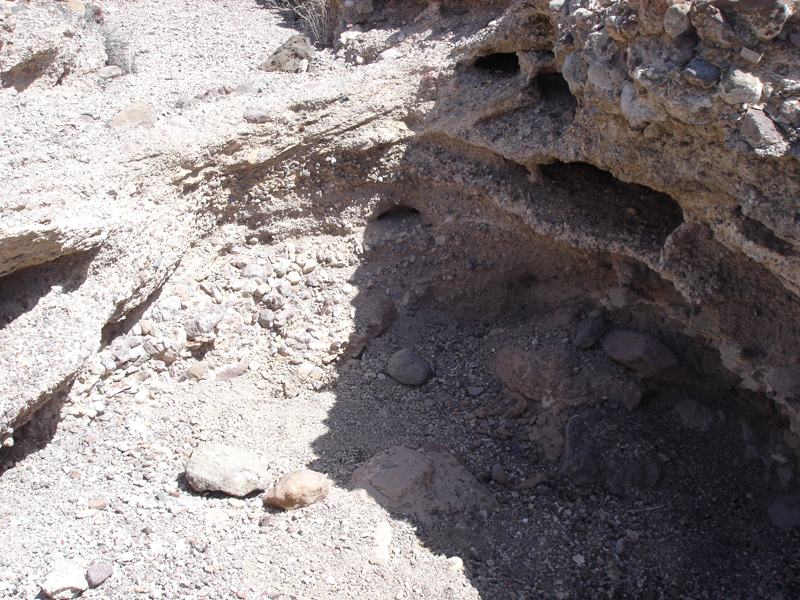 [below] There were a lot of dark basalts and patina covered rocks that kept your eyes busy all day. 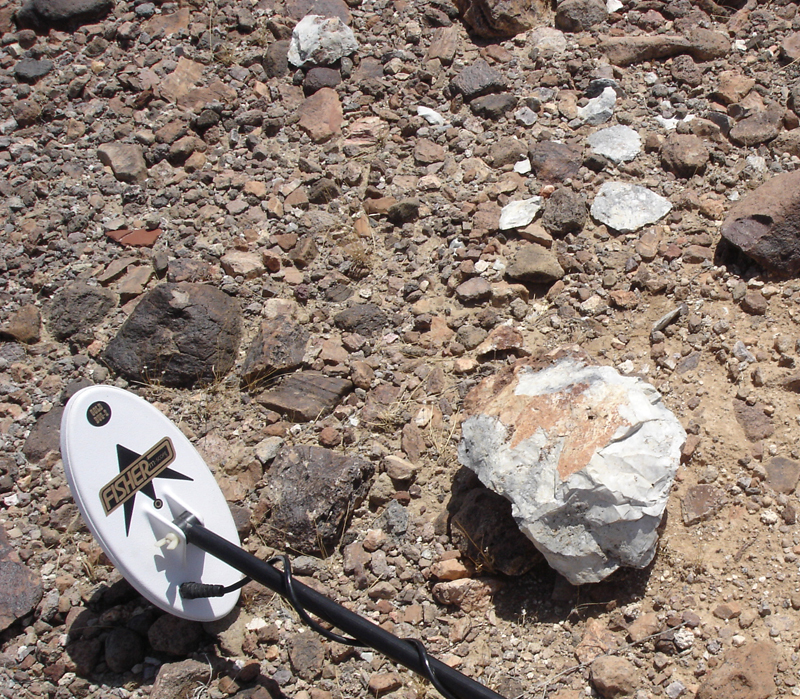 There was also no shortage of hot rocks, and those things made the GB2 scream! I don't know if they contained ore or what, but most of them sounded like a piece of steel. At least they were usually right on the surface and made such a distinct sound you would spot them quickly. 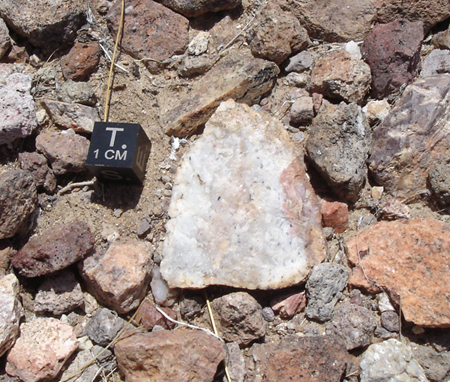 [below] About 0.25 mile from the trucks I found a white rock that appeared to have been chipped away at, with shards of the rock laying all around. The coil on my detector is 10" for scale. Immediately to the right of this rock I found an arrow head [below right]. The material was very bright and washed out the picture a bit, the tooling marks showed much better in person. 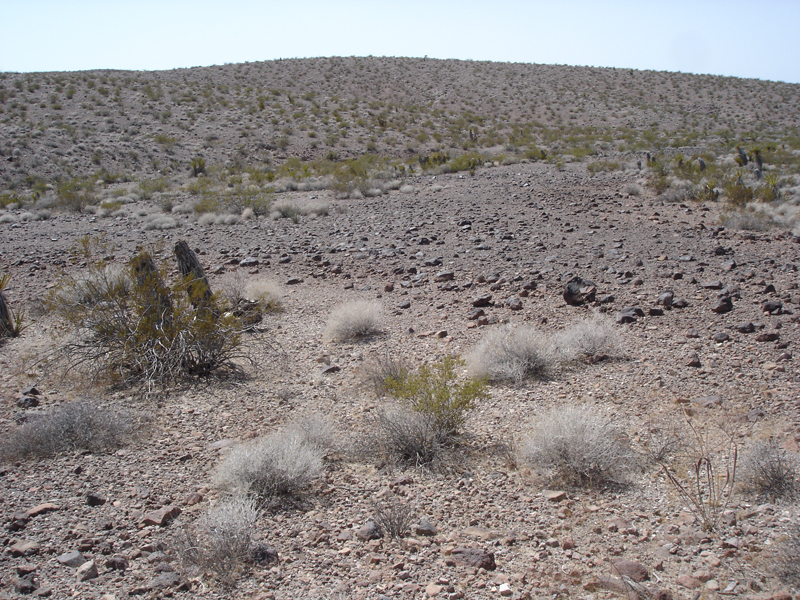 I thought it might be a paleo tool site, so I marked the spot in my gps and sent an email to the BLM archaeologist for the area to get his opinion. In keeping with current BLM policies I left everything as I found it. 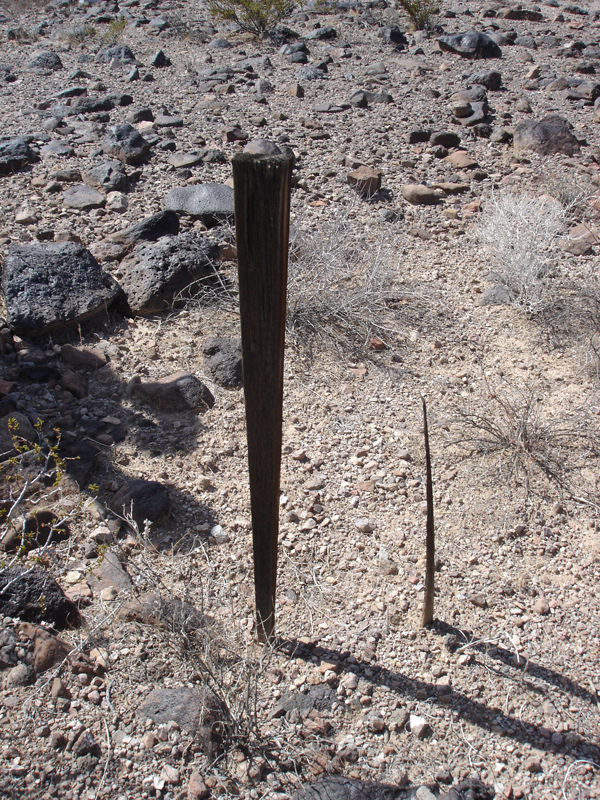 *UPDATE* I heard back from the BLM archaeologist, and he agrees that this is a flaking station. He had me send my coords. to the Needle field office so they can send someone to check it out; they cannot determine the age without "diagnostic artifacts". It's not a meteorite, but I still get to contribute a find of sorts. 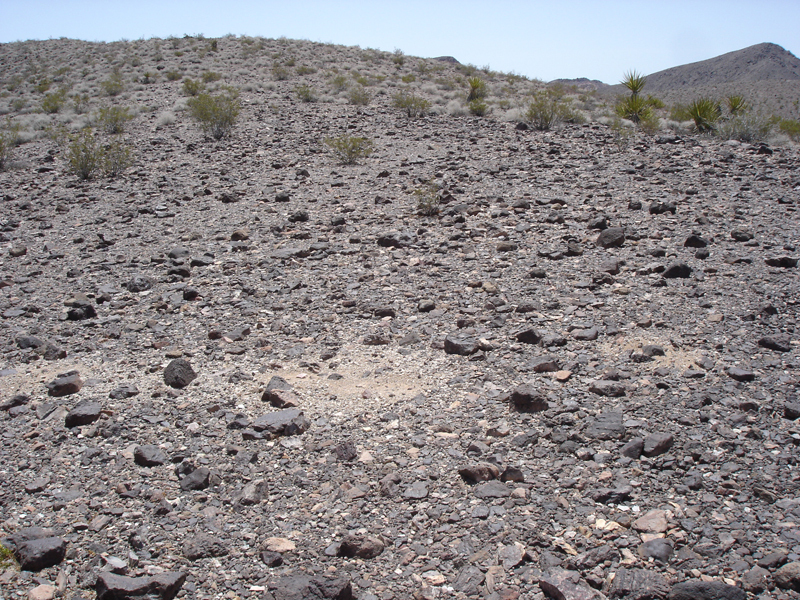 [below] The terrain a bit further from the trucks had fewer hot rocks and more of an overall lighter color. It was a perfect day, upper 80s, with a slight breeze. [below] This is also a great spot for rock hounding. Everyone found several cool rocks or crystals to bring home. [below] We found evidence of previous digs all day long just about everywhere we hiked. It was tough to tell how old they were; they could be 100 years old, or they could be from the more recent activity. 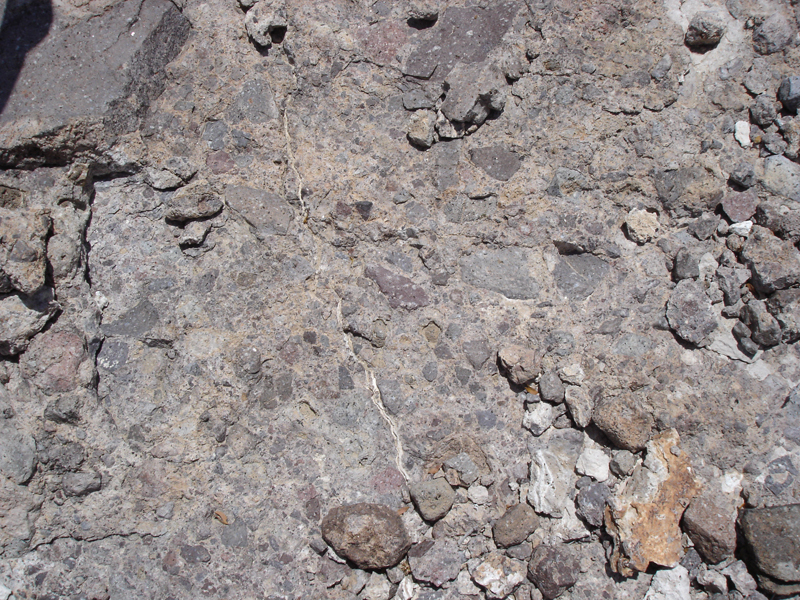 [below] In several spots the minerals in the ground have formed a natural concrete, and it's just as tough as the man-made stuff! I ran over a huge piece that was at the edge of a wash and it was like going over a speed bump. It survived my 6000 lb. truck, not to mention the water action from being in the flow-line of a wash. Tough stuff! 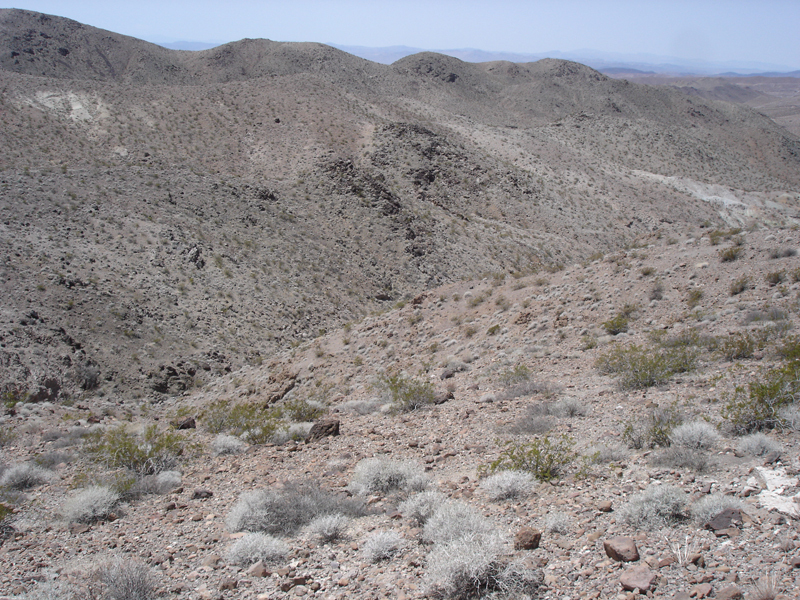 [below] Several valleys were a bit too steep to explore. 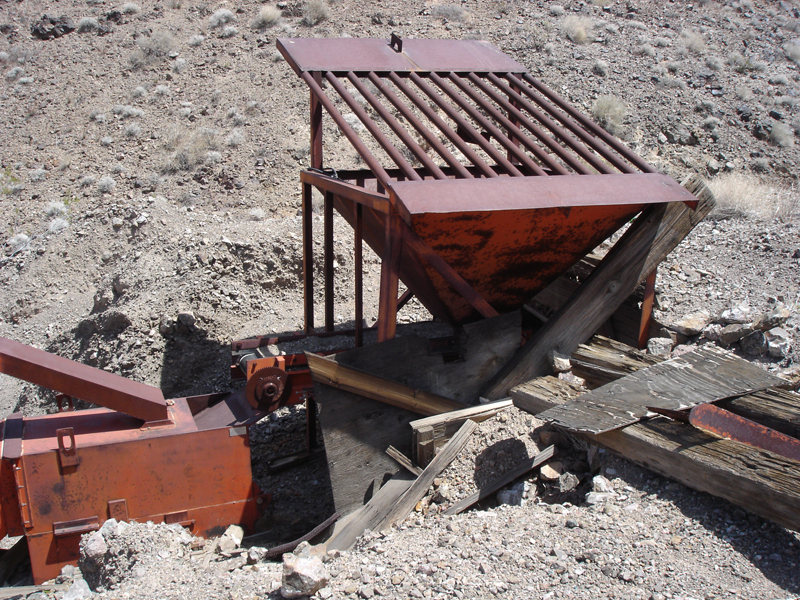 Robby and I crossed paths and decided to check out the Lady Lu Mine. The mine wasn't on my BLM map, but it did show up on my gps topo software. 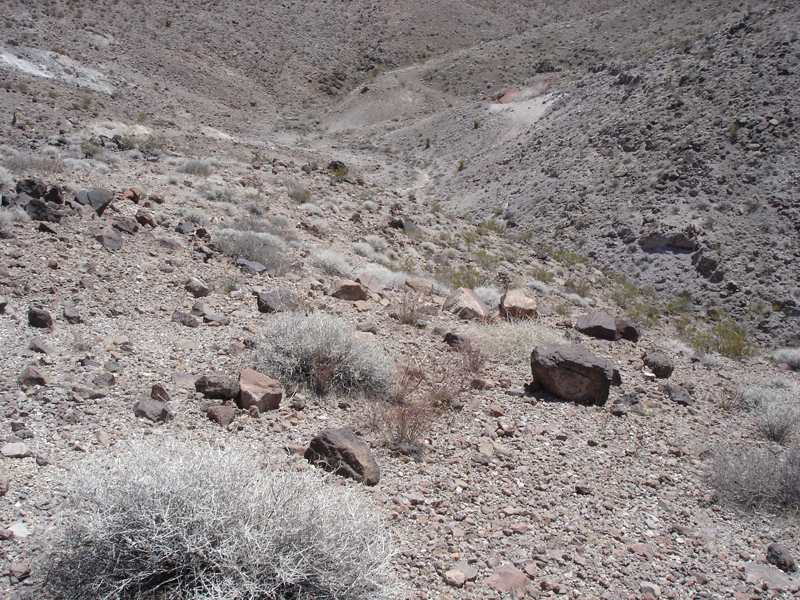 We crested a ridge and followed the path back to the mine [below], still swinging our detectors. The Bristol Mountains are rich with minerals. On satellite imagery you can see the green soil hues caused by oxidized copper leaching out of the hills. 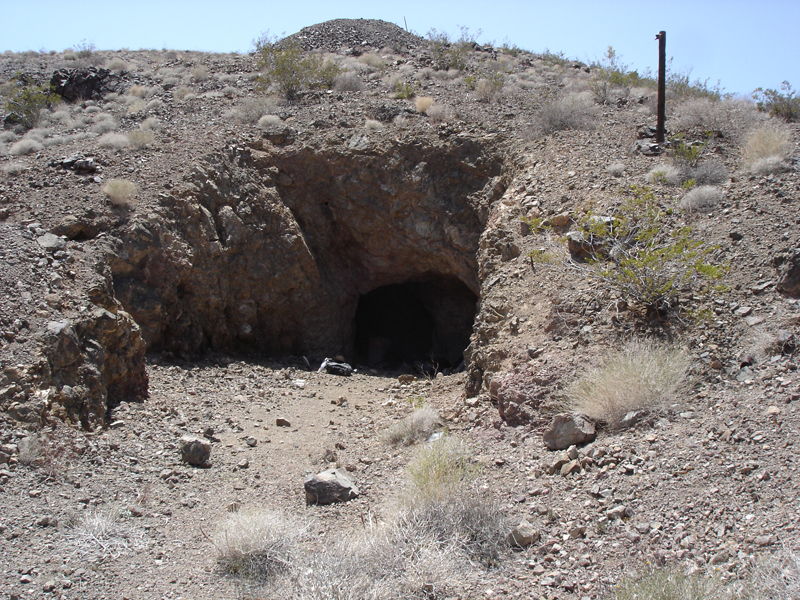 The area was mined over 100 years ago, here's a link with some info on the local area mining history. Prospecting is still going on in these hills today. I came across this mineral report for a mine prospect in the area, and as you can see there are some interesting minerals buried out there. 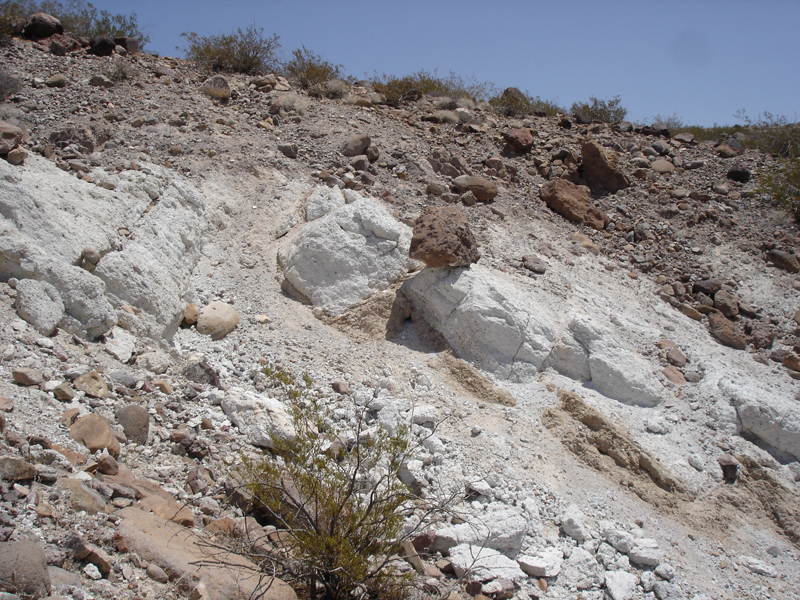 As we approached the mine I hiked up a hillside to a large outcropping of a white mineral with a boulder perched on top [below]. I feel like I should know what this stuff is, but its name escapes me. 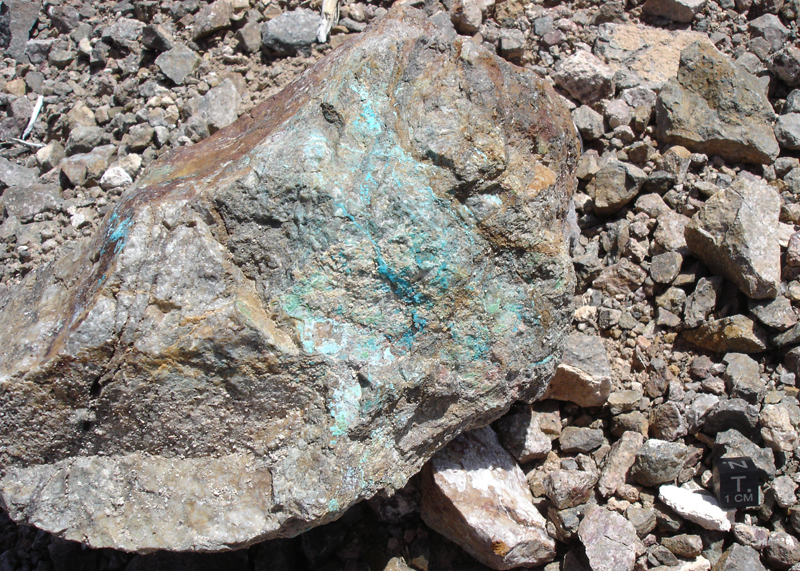 Gold and copper ore were two of the things that the miners were after here at the turn of the 20th century, and as we got closer to the mine there were pieces of copper ore everywhere [below]. [below] The Lady Lu Mine. About 10' in the tunnel makes a Y. Not knowing anything about the mine, that's as far as we went. Up above you can see the spoils from a vertical shaft that was about 60'-80' deep. We guessed it either connected to the tunnel, or was supposed to. 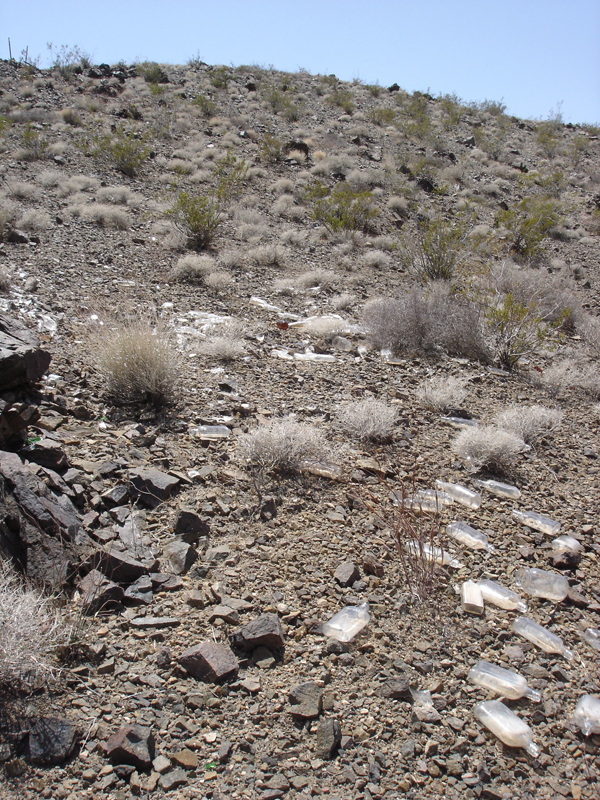 [below] Old bottles were scattered all around the mine. They were mostly pint and half-pint bottles, probably whiskey. 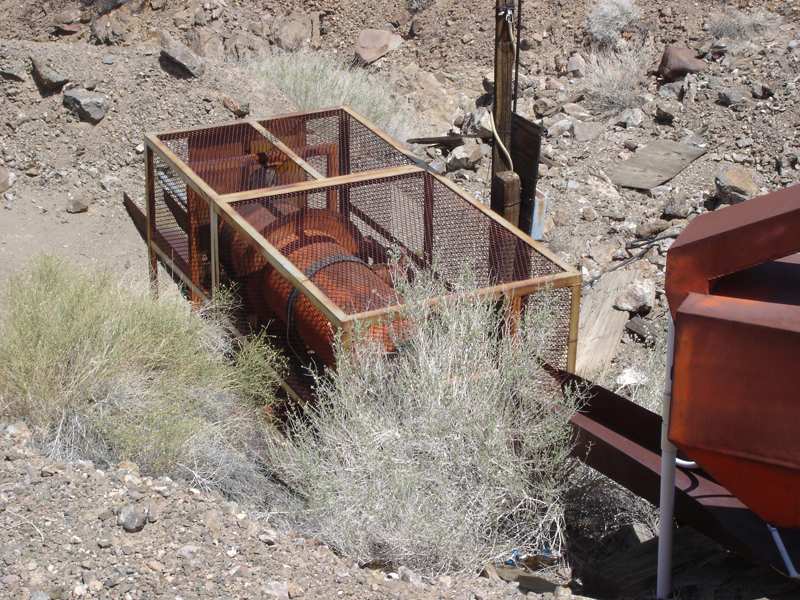 It takes a lot of whiskey to dig a mine shaft in the middle of the desert. Luckily there were very few broken bottles. People have been good about collecting the bottles in different areas, and leaving them there (you're not supposed to take anything man made that's more than 50 years old from BLM land). There was one large pile of contemporary green and brown glass bottles, too. It was probably from the people who were here most recently with the hardware pictured above. We all headed back to the trucks for lunch, then Robby and I headed out in a direction no one had been yet, while Roy, Cody, and Tom headed up to check out the mine. Bob had retired his detector and was hunting the hillsides by eye and magnet. 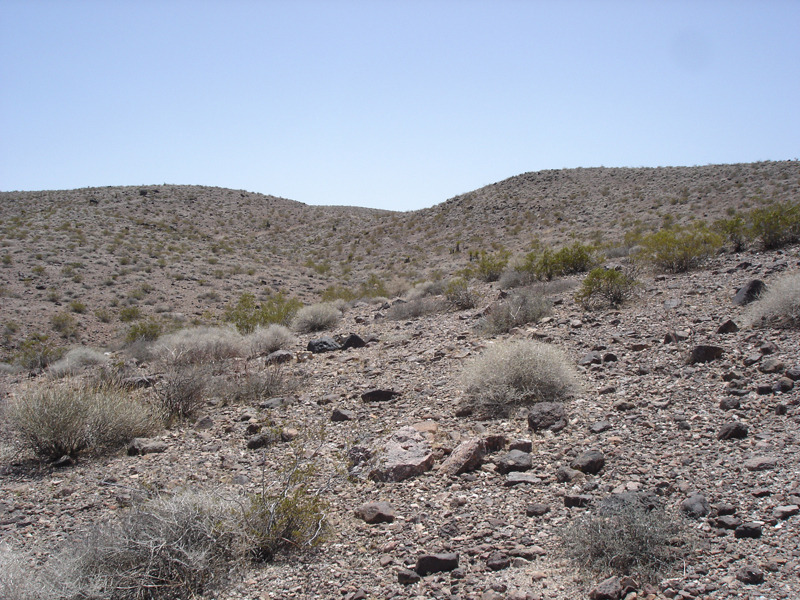 [below] The terrain flattened out a bit in the direction Robby and I headed. 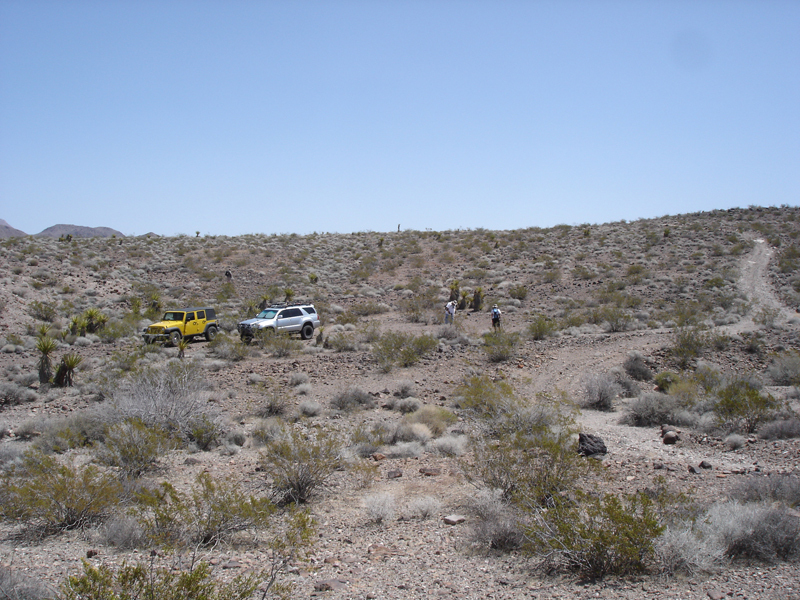 We were aiming toward a wash to take us to some ridges about 1.5 miles from the trucks. [below] My detector startled a local resident off their sunning rock, but they hung around to pose for a picture. Robby had an idea that we should start looking for gold since so many meteorites seem to be discovered while someone is out gold prospecting. Neither of us know much about looking for gold, but something I did know was that gold tended to congregate at waterfalls, and almost immediately we came across a perfect little fall [below]. That natural concrete I described earlier rimmed this perfect little bowl right in the flow-line of a dry stream. We checked, but only found a couple hot rocks. 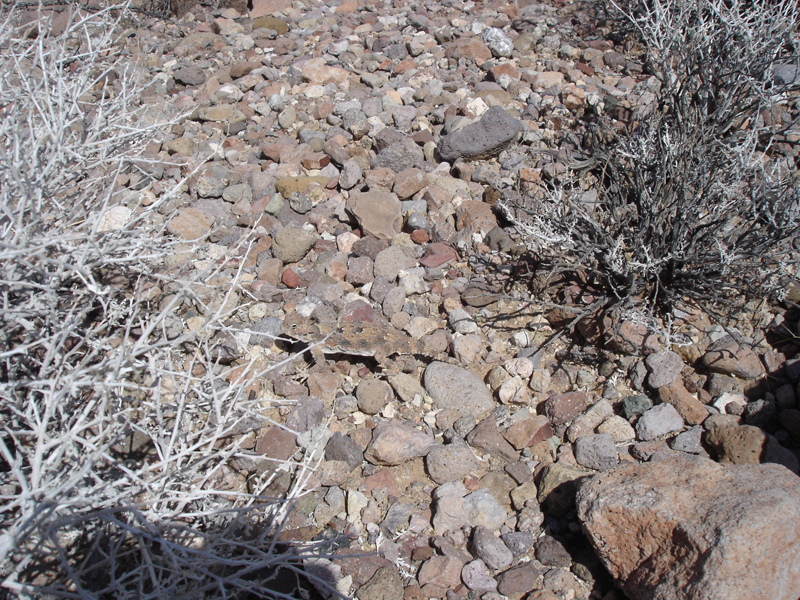 While Robby checked another part of the wash where two streams came together (another good spot for gold we'd heard), I walked downstream a bit further, and then up out of the wash and back on to the desert pavement. I stopped to wait for Robby, looked down, and saw what I thought was a piece of charcoal or burnt wood. Even though I expect any meteorites that will be found out here to be a bit weathered and probably rusty brown, it's still a reaction to check out a "black rock". I picked it up very idly thinking I would just toss it aside, but when I looked at it up close, it sure looked an awful lot like a fusion crusted fresh stone. Under a 10, 30, and 45 power loupe it still looked a lot like fusion crust. I held it to my magnet and there was zero attraction, and it did not register on the GB2. It looked sort of like a meteorite, but it otherwise doesn't seem like one. This rock weighs 20.45g. Its bulk density is very low (relatively speaking), only 2.4 g/cc, another signal it's not a meteorite; it's not friable enough to be a CI or CM and those are the only meteorites I know of that have BD's that low. 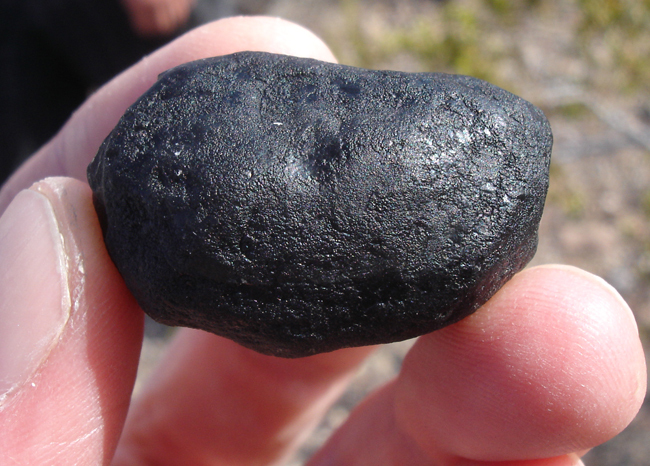 It was suggested to me that it may be a tektite, but I was informed that there are no tektites in the western US. It sure is curious looking. I am going to slice it open and see what it looks like on the inside. Chances are it's nothing, but it's the first thing I've found that I haven't known right away one way or the other. *UPDATE* After having it cut open it is, indeed, obsidian. Coolest piece I've ever found! [below] I always wonder what's over the next hill? Usually it's just another hill, but what's over that one? [below] An old sign? A marker? [below] This wash marked the boundary of how far out we were going. It was getting late and we had miles of 4x4ing to do to get back to the highway, and no one really wanted to try to navigate in the dark. 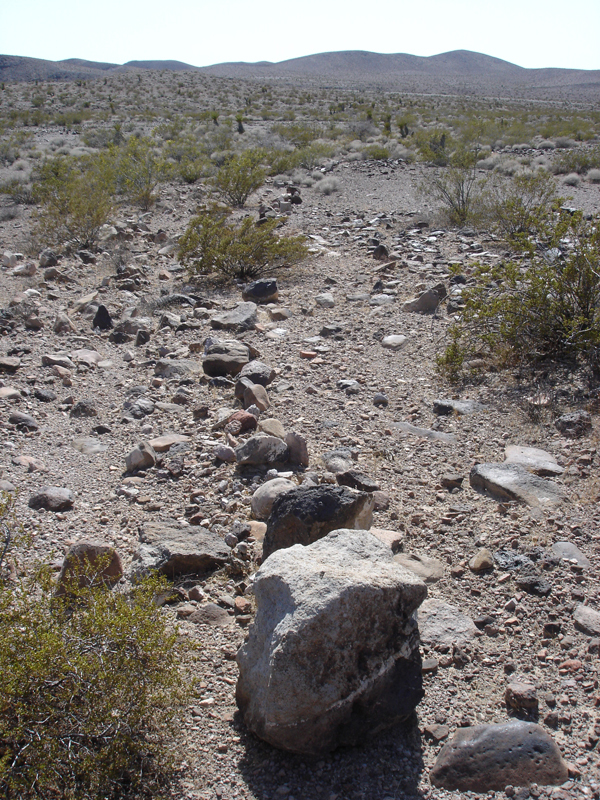 [below] On the way back to the trucks I spotted this odd alignment of rocks. Weird.